April 26, 2017, ©. Leeham Co: In our third article about Aeroflot, we cover the period from 2010 to today. During this period, Aeroflot started a strategic change. The airline decided to grow to a global world leader. To get there, the group needed a multi-brand strategy. The top brand, Aeroflot, should develop into a top tier premium airline. 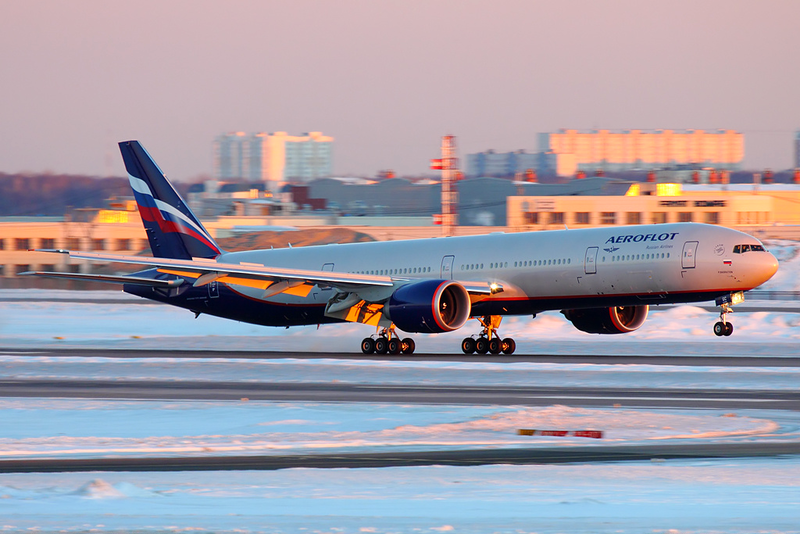 To understand the considerable changes Aeroflot needed to go trough for this strategy, we talked to Aeroflot’s Deputy CEO Strategy and Alliances, Giorgio Callegari, about the transformation. Callegari took us through the journey to a Four-star airline and the ranking of Aeroflot as the world strongest airline brand in its area of operation. To validate the improved ratings, we contacted Skytrax and Brand Finance, the issuers of the ratings. In the period leading up to 2010, where we stopped last time, Aeroflot gained stability and entered a global alliance, SkyTeam. During 2010, the Russian state decided to consolidate all its owned airlines into the Aeroflot group. Here, our interview with deputy CEO of Aeroflot, Gorgio Callegari, responsible for Strategy and Alliances, about what this would mean for Aeroflot. LNC: Tell us why you joined Aeroflot from Alitalia autumn 2011. GC: I was part of the management team that outlined the first turnaround plan for Alitalia, the one that did not happen. After that, I was contacted by Aeroflot. I met the chairman and the CEO summer 2011. They had just publicized the strategic goals for 2025, a bold move. I had thus black and white on the ambition to be one of the world’s top airlines by 2025 and they convinced me they were prepared to do what was needed to get there. LNC: But the Russians had just been through 100 years of Communist rule. It’s something that affects the thinking and mindset of people. Wasn’t the risk high, that the people in the organization would not accept the level of changes needed? GC: The Communist system had many disadvantages, but it brought the education level of the people to a level you don’t see anywhere else. The people we work with are young and well educated. And the motivation to change for something better is there. LNC: Tell us what has happened. GC: A lot has changed since I joined. We have integrated the group into four brands, each covering its market segment (Figure 1). Aeroflot is the premium brand. It has grown from nice million passengers to 29m today. Figure 1. 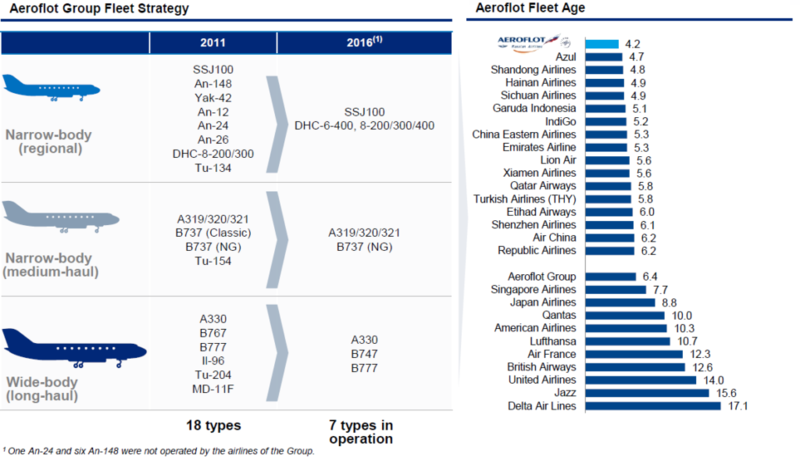 Aeroflot’s development since 2009. Source; Aeroflot. Click to see better. Our load factors have improved to over 80% and we now have one of the youngest fleets in the market, with 6.4 years average age (Figure 2). Figure 2. Aeroflot’s fleet as of 2016. Source: Aeroflot. We have achieved the results because we have executed a clear strategy. We are positioning Aeroflot as the premium brand, with Moscow Sheremetyevo as hub (Figure 3). We have gone from 400 movements per day to 700, and the airport will get a third runway next year, so we can grow further with a single hub. It is simpler and more efficient than a multi-hub strategy. Figure 3. Aeroflot’s multi brand strategy. Source: Aeroflot. Click to see better. GC: Rossiya integrates several of our domestic airlines into a medium price domestic group with Moscow Vnukovo as the hub. The integration could be done in six months, as the Russian market was in crisis and the airlines had no choice but to integrate. We now have a strong development in Rossiya, after the merger and refocus of the airlines. We have also developed a low-cost point-to-point carrier, Pobeda. This brand serves those that would not travel by air otherwise. Finally, the Aurora operation is a regional airline for remote cities in the Far East. We have achieved this rapid development and good profitability (Figure 1, one Ruble is about US$0.02) despite what the Russian market has gone through in recent years. The key to this stable development has been the focus on the home market and a simple hub structure. You take a lot of risk if your development is focused on external markets, where you have little control and brand value. Our strategy is to continue with the present approach. We will rather increase the frequency in our present network (Figure 4) than expand fast with new international destinations. Figure 4. Route network for Aeroflot group. Source: Aeroflot. Click to see better. LNC: Tell me how you achieved a Skytrax four-star and strongest airline brand rating. GC: In our long term plan, the Aeroflot brand should become a real premium brand. A key part of that is an excellent customer experience. We contacted Skytrax, where we had a three-star rating, and asked what need to be done to get to four stars. They audited us and told us what was missing. After hard work by all involved in Aeroflot, we got our four-star rating in June last year. We were also rated the World’s strongest airline brand in our markets, by Brand Finance. It’s very satisfying to get these awards (Figure 5). It shows we have really changed and that we are tracking to our plan. Figure 5. 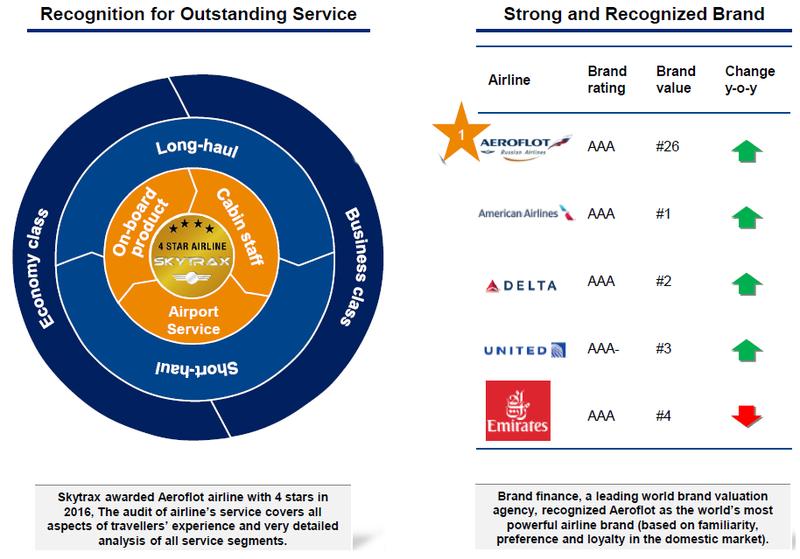 Aerflot’s Skytrax and Brand strength ratings. Source: Aeroflot. LNC: Will you stop there, or are you aiming higher? GC: We are not finished. We want to grow our customer services even stronger and increase our brand value (where Aeroflot presently ranked #26 between Cathay Pacific and Korean Airlines). We have not reached our targets yet. Aeroflot has been ranked by Skytrax over the past 14 years. It was ranked as a 3-Star Airline until this was upgraded in 2016 to 4-Star Airline status. Aeroflot was embarking on a programme of product and service development from 2012/2013, they wished to target 4-Star rating levels, and they entered into the Skytrax Audit system for developing this. Quality Audits are conducted by Skytrax across over 115 airlines each year. These comprise detailed product and service studies and analysis. Aeroflot had to enhance cabin seating, IFE, catering, cabin staff service techniques and soft service quality, together with development of airport lounge standards. Every year Brand Finance values over 3,500 brands – across all sectors and geographies. The results are tabulated and published in our reports and in the media. Our Brand Ratings are derived from the Brand Strength Index which benchmarks the strength, risk and future potential of a brand relative to its competitors in the markets it operates, on a scale ranging from D to AAA. It is conceptually similar to a credit rating. The Aeroflot brand rating is AAA with an index of 88. This is the highest rating of any airline. We calculate Brand value using the Royalty Relief methodology which determines the value a company would be willing to pay to license its brand as if it did not own it. This approach involves estimating the future revenue attributable to a brand and calculating a royalty rate that would be charged for the use of the brand. The present brand value for Aeroflot is placed as No. 26 in the airline market between the brand of Korean Airlines and Cathay Pacific. It is astonishing to see Aeroflot has abandoned all flights from St Petersburg (other than to Moscow). It would be interesting to see a discussion about the pros and cons of that. This would seem to cost them all their European traffic between St Petersburg and other cities in Europe – who wants to transit SVO and probably double the travel time when there are often nonstop flights direct to LED? In your financial analysis, do you know if the overflight fees charged by Russia are still passed to Aeroflot? Or does the govt now keep those for themselves? Their multiple branding is made all the more interesting when they code-share, for example, both Rossiya and Aeroflot flights on the same plane. Do you believe Aeroflot – under the guidance of a former Alitalia exec – might become the first airline to successfully commingle multiple brands this way? Am I the only one to roll my eyes when looking at the largely artificial distinctions of target groups between the various brands? Indeed, looking at their route map, it seems the main differentiation between the different brands is not the thin differences in target markets that they claim, but rather the routes operated. They really aren’t competing brands at all, they are just different names for different routes. Lastly, it is astonishing, in a different sense, to see you citing Skytrax. Do they have any credibility at all?